Nourish & protect every cell in your body with this abundant array of plant based Essential Fatty Acids e.g. EFA'S or Omegas 3, 6, & 9. This bowl will be sure to keep you sustained right through your day & is high is not only high in essential Vitamins/Minerals But dietary fibre, proteins, plant sterols & your omega 3 & 6. So for a digestive system that's smiles with abundance & optimal health levels add this nurturing breakfast mix into your daily scope. 1. In a large 1kg container or jar mix all your dry ingredients. I find it easier to do this in a large mixing bowl and then transfer over into your storage choice. 2. In a breakfast bowl place 1 & 1/2 cups of your from earth mix into your bowl. 3. Slice up your banana. Add both your banana & blueberries to the bowl giving it a mix through. 4. Pour over your almond or oat milk & stir through. 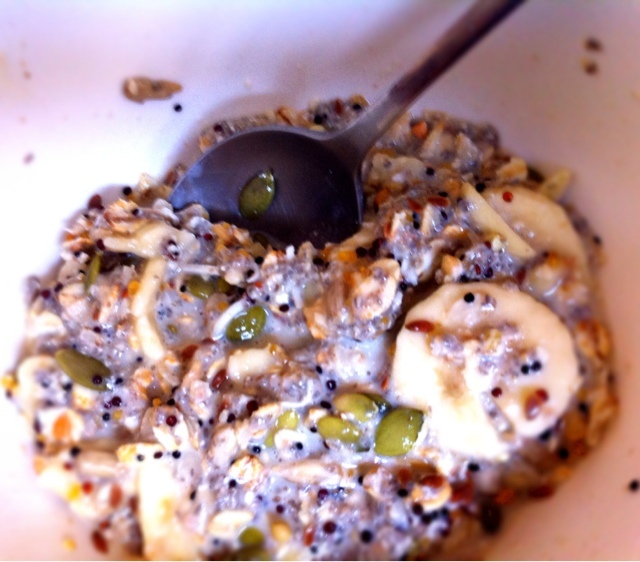 It will make a porridge like consistency from the chia bran. Enjoy! On cold mornings you can add some boiled water for that extra warmth. Health Warning! How much Sodium are you are you eating per day?